I attended part of a day organised by Glamorgan Botany Group to look for Wilson’s Filmy- Fern Hymenophyllum wilsonii. This had been found by Tim Rich at Dare Valley Country Park among boulder scree at the base of a small corrie. He had found four plants and wanted to see if there was any more so about eight of us spent a couple of hours searching and clocked up over 50 records. 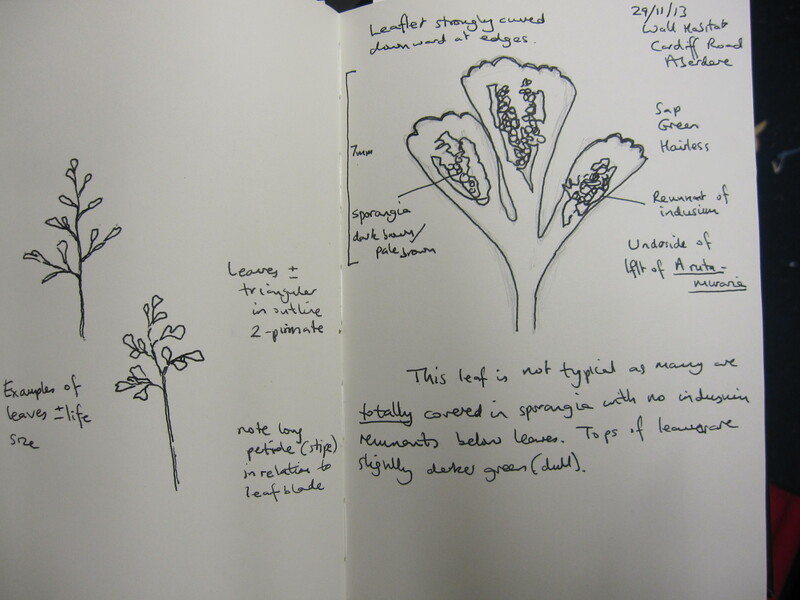 If there is one good way to learn about plants then searching for one species on your hands and knees is a pretty good way of getting your eye in. I don’t think I’ll forget what Wilson’s Filmy-Fern looks like in a hurry! This is proving to be quite an interesting site because there is also a large colony of Fir Clubmoss Huperzia selago which along with the Filmy-Fern seems to have been overlooked by Victorian botanists from this area. I found what appeared to be 2 different types of leaves the plant on the left being flatter and paler, while the one on the right had more obviously curved leaves. 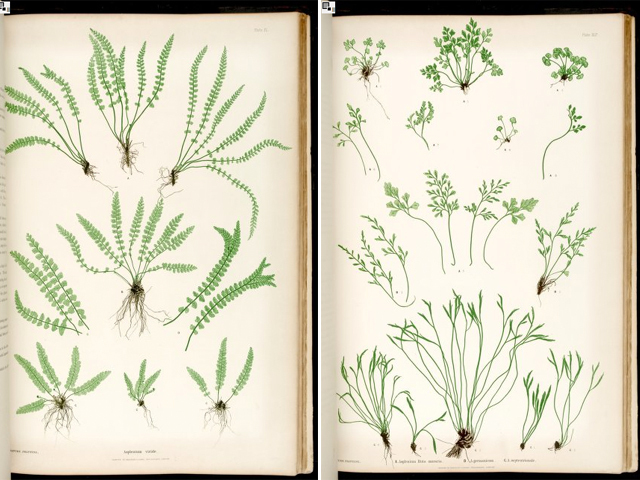 Obviously I was thinking the one on the left could be Tunbridge Filmy Fern H. tunbrigense but closer examination with the microscope suggested this might be too much like wishful thinking. 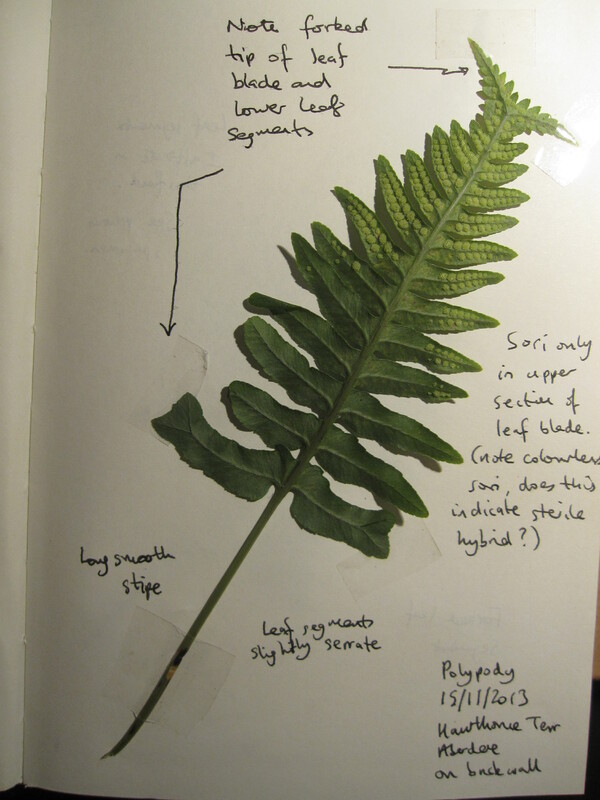 Although the leaf veins do not quite reach the tips of the leaves the cells appear mainly rectangular so it is most likely to be Wilson’s Filmy-Fern. For comparison the following photo is the plant on the right, definitely Wilson’s. 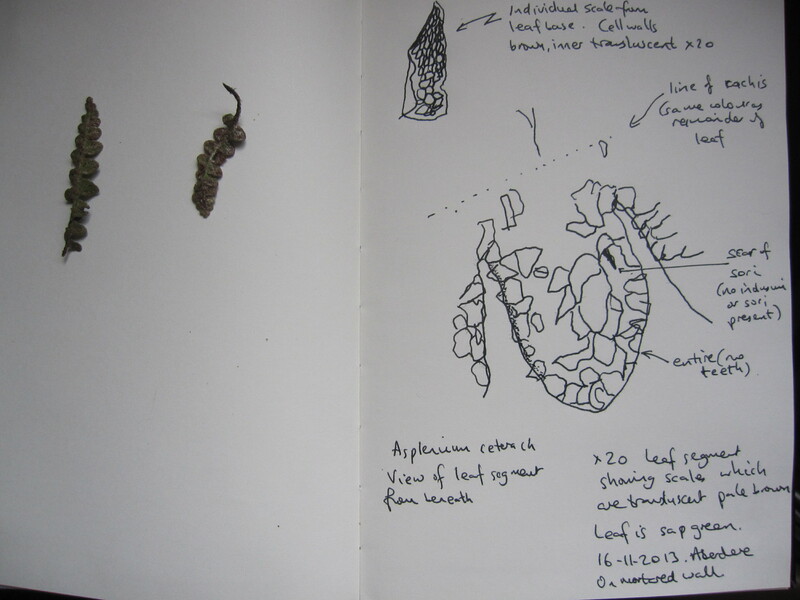 I will go back later in the year to check the indusium margins which may be a more definitive character. In his series of drawings called Nourishment, the artist Michael Landy collected weeds growing on the streets of London, kept them alive and then drew them life size. He then made a set of 37 etchings, some of which have found their way into the Tate collection. Landy made his name as one of the Young British Artists when he destroyed all his personal possessions. 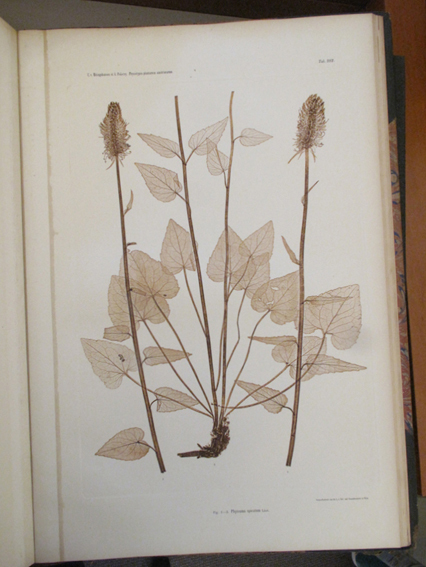 The prints of weeds came about after this because they represented the spirit of survival. Another book called The ferns of Great Britain and Ireland (1855) by Thomas Moore, illustrations printed by Henry Bradbury, has coloured plates. Bradbury placed the specimens between a highly polished lead and steel plate under pressure. The resultant print was highly detailed and in this case hand painted to provide a useful identification guide. The book can be viewed here. His contemporary Alois Auer, produced work such as this. Nature printing came to an abrupt end in the 1890’s as photographic techniques improved. Michael Landy’s brief excursion into botanical illustration ended with the Nourishment prints and he went on to do a similar set of portraits of his friends and family. I remember seeing this same Shield fern (Polystichum) over 15 years ago growing near the top of a hedge bank above a small stream. From my memory it doesn’t seem to have grown much or spread into its surroundings, so just how long do individuals like this survive? If it has been in the same spot for 15 years could it have been there for the previous 15 years, or the 15 years before that? And so on. Anyway I wanted to identify it, I know its a Polystichum because of the circular disc shaped (peltate) indusium attached to the leaf at its centre (though a bit of imagination is required at this time of year), combined with bristle pointed leaf segments. 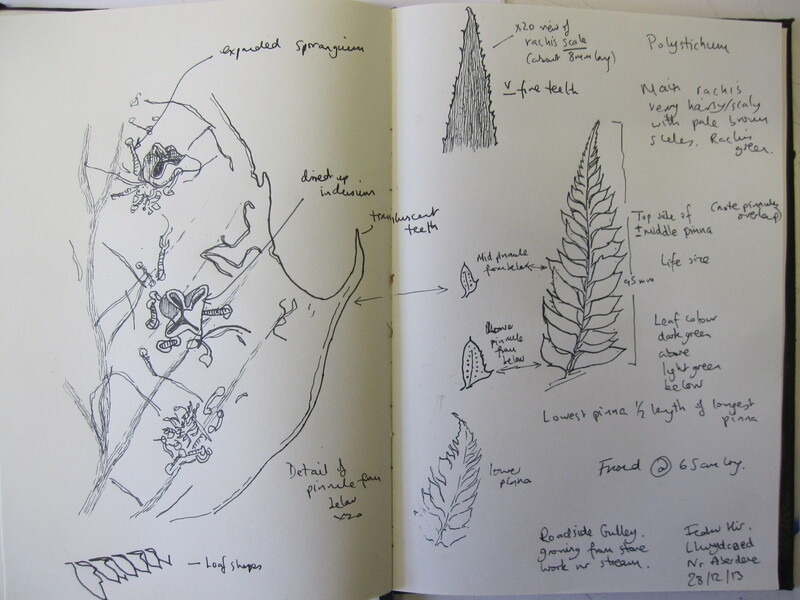 What I need to know is whether its Hard Shield Fern Polystichum aculeatum or Soft Shield Fern Polystichum setiferum. 1) whether the frond feels soft (setiferum) or hard (aculeatum). Obviously this is very subjective but I would say this frond feels hard. 2) if the pinnules are stalkless (sessile) = aculeatum, or stalked = setiferum. I found this quite hard as the pinnules varied greatly. I found the silhouettes in the Plant Crib to be the most useful. 3) if the lowest pinna is half as long (aculeatum) or if it is more or less the same size (setiferum) as the largest pinna. In this example the difference in length is marked. 4) Whether the angle of the base of the lower pinnules of each pinna rachis are obtuse (setiferum) or acute (aculeatum) angled. The majority of these pinnules are acute. So overall it seems to be Hard Shield Fern P aculeatum. I didn’t find it easy to identify as a lot of the diagnostic features are subjective and there is some variability e.g. are the pinnules stalked or not? 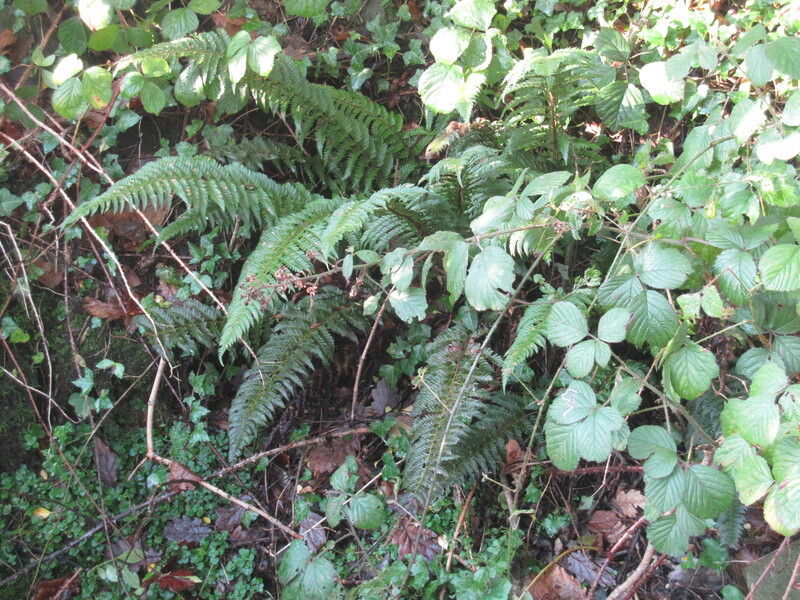 Additionally there is a hybrid between the 2 shield ferns; P bicknellii. For me the most straightforward guide to identification of these 2 and the hybrid is the Plant Crib which is available on the BSBI website. With these similar plants of the same family I think it would be useful to have specimens or good quality photographs to compare. 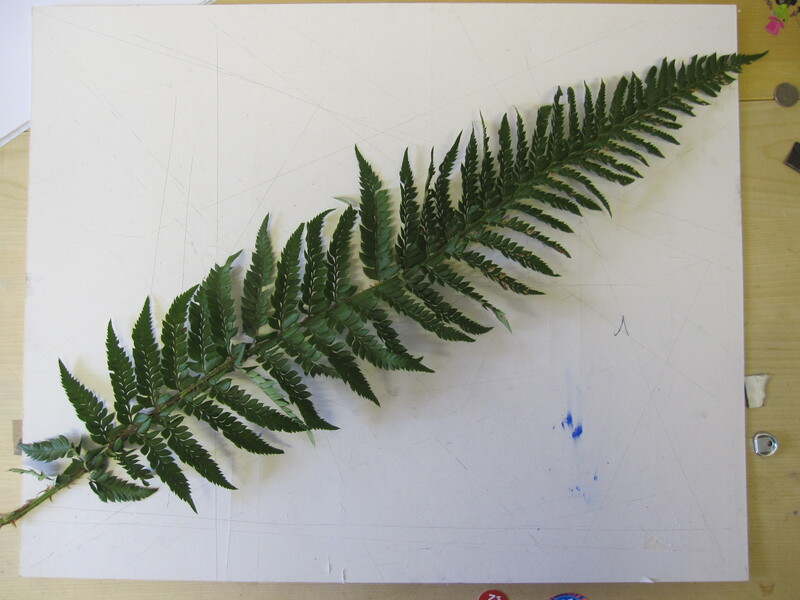 The habit and triangular leaf shape mean that this is a fairly straightforward fern to identify. Rustyback Ceterach officinarum (formerly Asplenium ceterach) is the least common of the ferns found on the walls here. It is however thankfully fairly distinctive because of the fine scales which cover the underside of the leaf segments. These appear golden brown at this time of year but in the spring are a sparkling silvery mass. Under the microscope the scales are actually made of large cells which are translucent centred but coloured around their edges. The underside of the rachis appears the same green as the rest of the leaf surface but the stipe is covered in dark scales. At this time of year the sori seems to have dropped off but the sori scar shapes are still there. Like polypody, this fern lacks an indusium. Whereas Maidenhair Spleenwort Asplenium trichomanes and Wall Rue Asplenium ruta-muraria are commonly found around here on the sides of mortared walls, their tops are often crowned with the foliage of another fern, Polypody. 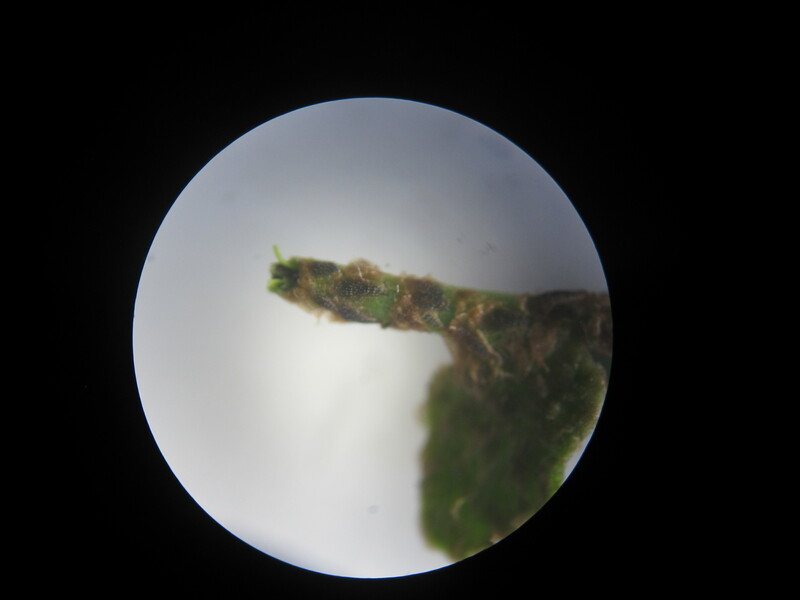 Unlike many other ferns, polypodies lack an indusium (membranous cover) over the sori; so when looked at through a hand lens the individual globular like sporangia are immediately visible. 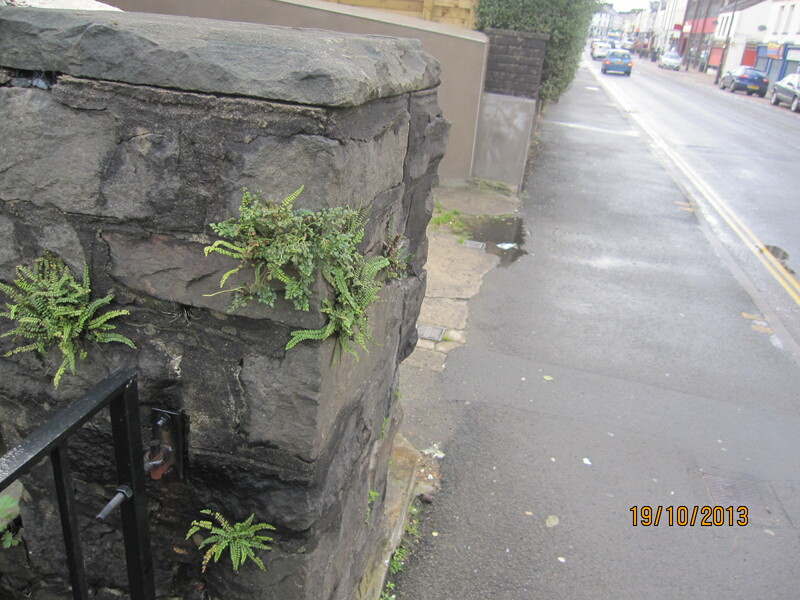 Although it was originally thought that there was just one British species of polypody with various sub species, now it is recognised there are two main species; P vulgare and P cambricum which produce a fertile hybrid P interjectum and between these three there are a complex variation of forms. Although there are certain morphological characteristics that may be useful to help identify what the Polypody may be, they are not definitive. Microscopic examination of the cells on the sporangia called the annulus is required. In the specimen I found there were no fine hairs(parphyses) growing between the sporangia so this suggests it is not at least P cambricum. It may be a hybrid between P vulgare and P interjectum but as I don’t know then it should be described as P vulgare agg. (not P vulgare). An interesting feature of this specimen is the forking of the apex of the leaf blade and the lowest leaf segments. This ability of ferns to produce unusual variations in leaf shape was highly prized by Victorian collectors, who decimated many wild populations.